Recently I was out on the town with a few of my friends enjoying some food and good conversation. A topic came up about a friend of a friend who suffered an unexpected financial emergency and could not come with the funds to cover the cost. This got me to thinking – How many people really have enough extra money saved to weather an unexpected emergency? I’m taking about available cash – not just using available credit on a credit card. According to a study released by the Federal Reserve Bank of New York in February 2017, just over 30 percent of responders felt they might need $2,000 to cover an unexpected expense in the coming month, but said they could not come up with the money to pay for it. To put that into perspective, 3 out of every 10 people would not be able to come up with $2,000 in 30 days to deal with an emergency such as a home repair, visit to the veterinarian, root canal, or a trip to the emergency room. One of the most common financial emergencies is an unexpected medical expense. In a study by Amino, 37 percent of people said they could not afford an unexpected medical bill greater than $100 without going into debt. Only 23 percent of Americans said they were able to cover an unexpected medical bill of more than $2,000. That is a very sobering statistic – not only on the state of our health care (a topic for another day), but also on the state of our ability to save money. So, what does this all say about our finances? Does this only affect the middle to lower class workers or does this also pertain to the upper class as well? With so many Americans living so close to the edge, financially, how does this affect other aspects of everyday life? When someone does not have enough available cash in a savings or checking account, paying for an unexpected expense may have to be dealt with by using a credit card. Using credit cards has become a type of “safety net” for those unable to save money for a rainy day. The problem with using credit cards for these types of expenses is that it may negatively affect your FICO Score. According to myFICO, the amount you owe on all accounts (your credit utilization) makes up 30 percent of your credit score. Therefore, if you have a lot of debt on a lot of different credit card accounts, your credit score is going to take a hit. Taking credit utilization to the extreme, maxing out your credit cards to pay for these expenses can drop your score by up to 100 points. When faced with a large unexpected expense and no savings to pay for it, one is forced to do a juggling act with available money and bills due. Living paycheck to paycheck, as many working Americans are doing these days, leaves very little wiggle room when it comes to fitting in another bill to pay. Next comes the decision on whether or not to pay a bill on time or maybe leave it go until next month. But choosing to make a late payment is probably one of the worst things you can do for your credit. Payment history is the biggest factor of your credit score (35%) so having just one 30-day late payment may cause your score to decrease. Once you break the rule of always paying your bills on time, you might fall into the habit of making other payments late or not at all. As you can see, there is a downward spiraling effect going on and it will only go further down from there. Could You Raise $2,000 in 30 Days? It makes you stop and think – what would you need to do to raise $2,000 in 30 days? Sell some jewelry, your vintage guitar, or liquidate some other personal possessions? Or would you be able to dip into your savings account and come up with the cash? If you can relate to the first scenario, then it may be time to re-evaluate your financial goals. If you had started an emergency fund three years ago by saving $50 per month, you would have almost $2,000 saved for unexpected emergencies. Having this emergency fund would keep you from adding new debt while trying to pay down the old debt. It would mean no more borrowing, no damage to your credit because you can pay your bills on time. Even those of you making a six-figure salary are not immune to this lack of better judgment. David Johnson, an economist at the University of Michigan who studies income and wealth inequality, sees that when people get money – a bonus, inheritance, high salary – they are more likely to spend it than to save it. 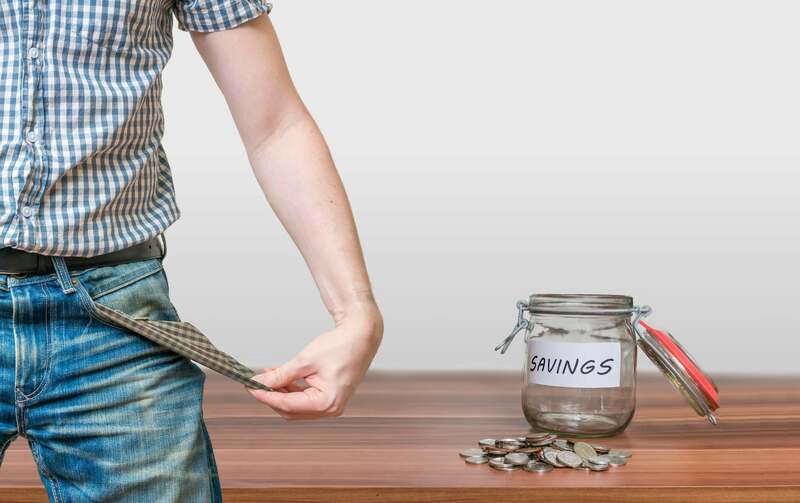 So, no matter if you earn $20,000 year or $200,000, the struggle to save money is the same. If you don’t have an emergency fund, it’s not too late to start one. Make a plan to start saving and stick to it – before you know it you will have a nice little nest egg all ready for the next unexpected emergency that may come up in your life. If you’ve had trouble saving money in order to cushion yourself from emergencies and your credit is suffering as a result of missed payments or high credit utilization, it may be time for professional credit repair services. You can also carry on the conversation on our social media platforms. Like and follow us on Facebook and leave us a tweet on Twitter. This entry was posted in Credit 101 and tagged credit utilization, debt, FICO, late payments, savings. Bookmark the permalink.